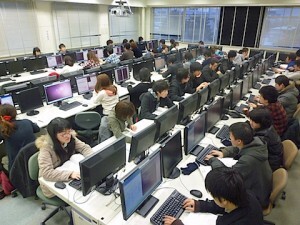 In the Mathematical Science Course, we offer a joint class for computer exercise with the Human-Centered Computing Course. It is conducted in the computer-practice room in the 5th building of the Department of Engineering and Science, which is prepared apart from the ITC computer room. This room is installed with the access-controlling system by IC cards. So, the students in the Mathematical Science Course are free to access the room and can use the computers anytime they want. The details are shown in the webpage.